Looking for skincare that’s 100% free of parabens, phenoxyethanol and any other kinds of preservatives yet is stable enough to have a long shelf life? LG – the famed Korean home appliances company – is all set to debut Frostine, the world’s ‘refrigerated 5℃ skincare’ collection. Known as ICEMETIC (ICE + CosMETIC), this new generation of refrigerated beauty goodies will also contain no colouring, no preservatives nor antiseptics, no fragrance, no heavy metals and will completely rely on temperature for product stabilisation. This is the first commercially available skincare collection that tackles the main problem for natural or preservative-free cosmetics: Ingredients such as oxygen and antioxidants are sensitive to heat and light, usually decomposing within a few days in the absence of chemical preservatives. LG joined hands with the Korea Polar Research Institute to solve this problem. The result? A new patented nontoxic antioxidant called Ramalin, which is based on the Antarctic Lichen. This Antartic Lichen is found 2,500m below sea level, lives in extreme cold, dry and frugal conditions (–100°C) and has a microscopically slow growth rate of 1 cm every 100 years. Given its natural environment, the plant has undergone a number of adaptations that enables it to survive, including the ability to net photosynthesis while being frozen at temperatures as low as –20°C. It can also absorb water from snow and ice, while being able to survive long, unfavourable periods of drought in a dry and inactive state. And that’s not all it does: Ramalin is scientifically proven to be 1.2 times more potent than ascorbic acid in scavenging free radicals and 1.25 times more potent than commercial kojic acid in tackling hyper-pigmentation. It’s not been an easy journey: LG has invested a lot of time and money on the development of Frostine, including the setting up of an entirely separate facility to prevent contamination and finding innovative ways of packaging and distribution (due to the need of maintaining low temperatures). 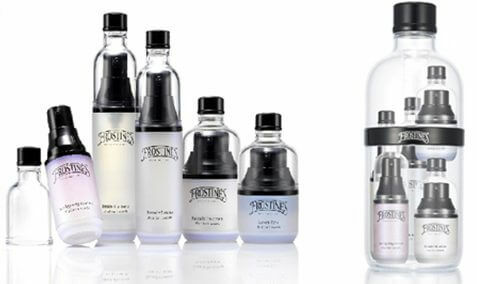 Frostine products are only activated at a low temperature and are best stored between 3℃ to 10℃ degrees. But you don’t need to invest in a special unit to store these products – the cosmetics are designed to fit conveniently into normal household refrigerators that are tuned to about 10℃ degrees. 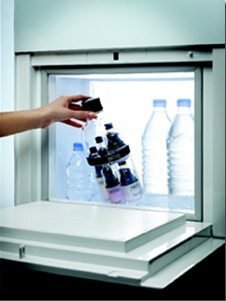 LG has designed a airless container that prevents the entry of food odours and keep the products clean and hygienic. The life expectancy of the products is around 6 weeks after the first use. If unopened, they can be kept in the fridge for about 6 months. They will be released to the public in major departmental stores and online stores starting late May. So, stay tuned! What do you think? Will this define a new era in natural, preservative-free cosmetics? Or is it a flash-in-the-pan gimmick that will fizzle out once the initial excitement is over?